This none descriptive ABS water breakers is not readlily available on the consumer market. Our growers had a demonstration by our local supplier's rep, and they were sold. This is one of the "softest" water breaker one can find on the market for orchids. Compare to other water breakers, this one has a spray pattern is very narrow, so there is no waste of water like the others. 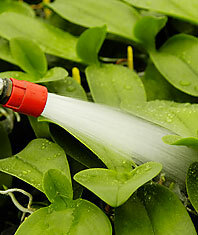 For this reason, our growers report they can drench orchids to flush a plant of fertilizer or chemical residues on a regular basis. This is an enssential tip for successful orchid cultivation.